The Annual Membership Tea is an opportunity for prospective members to meet the members of the Zebulon Pike Chapter. Zebulon Pike Chapter, NSDAR. The content contained herein does not necessarily represent the position of the NSDAR. 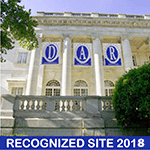 Hyperlinks to other sites are not the responsibility of the NSDAR, the state organizations, or individual DAR chapters. Please contact webmaster for site issues.